What does the Miphkad Gate remind us of? Jesus brings us together. God also calls us to be a body — not a lone ranger Christian. Because of Jesus, we are one big family — different shapes and sizes, yet all One in Jesus. While God’s Spirit lives in us, when we gather together, we can show each other the Jesus in us — we can encourage each other; when one falls down, the other can pull him up; when one is happy, they others can celebrate with him; when one is sad, the others can share their sorrow. It’s like a family gathering together at the dinner table (e.g. Daddy/Mummy ringing a bell or calling everyone to come to eat), instead of each person eating by themselves in their room. That’s why we can come together as a big family every Sunday to celebrate Jesus … not just with mummy and daddy, but also with other aunties, uncles, grandparents and friends. That’s why we should come together as often as we can to hear about Jesus and what He has done for us. And one day, when Jesus comes again, He will gather ALL of us together in front of His throne. What a wonderful family gathering that will be! Rev 7:9 After this I looked, and there before me was a great multitude that no one could count, from every nation, tribe, people and language, standing before the throne and before the Lamb. 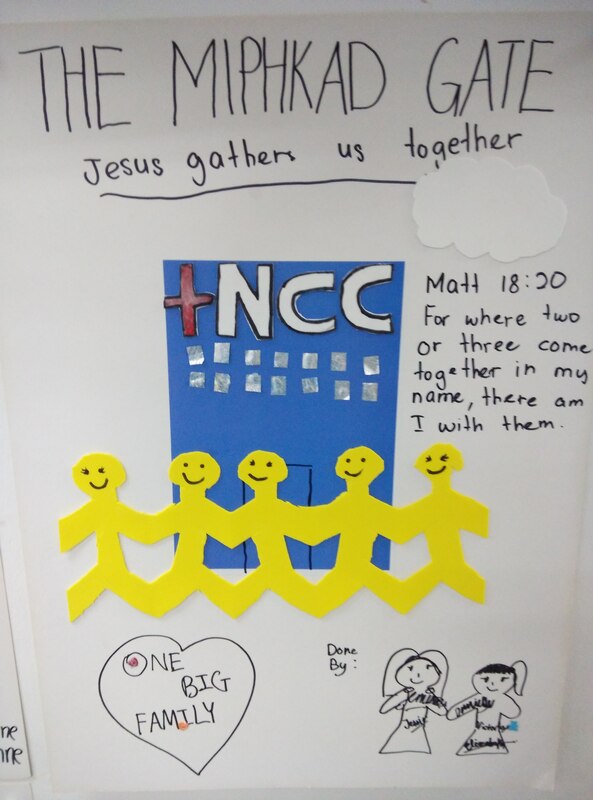 The Miphkad Gate reminds us that Jesus gathers us together. Memory Verse: Matt 18:20 For where two or three come together in my name,there am I with them. Let me tell you a story about some children who lived a long time ago. It was a normal day for the children in the village. They would be at home spending time with their family or playing together with their friends. The children jumped to their feet when they heard this. They had heard people talking about Jesus. He sounded like a very special and important person. The children rushed out the door. They saw many other children with their mothers rushing in the same direction. As they turned the corner, they saw Jesus! Many people were around Him. The children started to make their way up to Jesus. The children were disappointed and a little afraid. They started to turn back. Then as if a door had been opened, all the children made their way to Jesus. He wrapped His arms around them and prayed for them. It was a very exciting day for the children. They were able to see how much Jesus loved them. They got to see that Jesus wanted to spend time with them. Jesus loves you boys and girls too. He loves you so much that He died and came back to life so that you could spend forever with Him. He really wants to be able to spend time with us when we are alone. And He also loves it when we gather together to sing praise to Him and learn more about Him through the Bible, just like today. We can gather together because Jesus brings us together.